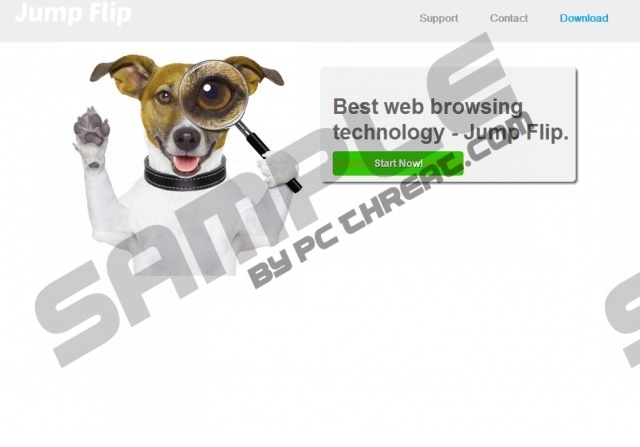 When you install JumpFlip onto the Windows operating system, it is likely that you will discover various pop-up offers and money-saving deals presented on Google Chrome, Internet Explorer and Mozilla Firefox web browsers. Have you installed this program onto the PC already? Where did you acquire it from? This question is extremely important because the official download page jumpflip.net is not active, and so third parties must have been involved. If you have downloaded the application bundled with other programs unknowingly, it is most likely that now you wish to remove JumpFlip. Continue reading to learn how to get rid of this undesirable plugin from the browsers. JumpFlip is an adware, or advertisement supported program, so you should not be surprised to discover various pop-ups showing up on your browsers. Some of these pop-ups may promote beneficial deals and provide links to authentic websites; however, in other cases, these could generate traffic to unreliable, even malicious websites. Needless to say, there are different security risks which you could face when visiting such websites. Note that schemers may use misleading information to trick you into downloading fake malware detection and removal software or into exposing your own private information. Needless to say, it is best to stay away from any suspicious pop-ups, surveys and virtual contests. The suspicious JumpFlip has been developed by Super Web LLC, and our researchers have discovered that this company is also responsible for the activity of BetterBrowse, Kozaka, SizlSearch and Monarimo browser plugins. All of these applications are meant to help you find the best deals and interesting online offers; however, none of them can be installed from the official download pages. Due to this many virtual security researchers believe that Super Web is creating virtually inactive applications to aid the operations of third party online advertisers. Do you know how to delete JumpFlip without causing any harm to the operating system? The success of this task depends on the programs which are running on your personal computer. If you are dealing with the suspicious plugin only, you can use the manual removal instructions below. However, if other undesirable software or spyware exist – install automatic malware detection and removal tools. We recommend SpyHunter because this application can delete potentially running threats and keep your PC guarded reliably. Want to learn more? Post your questions in the comment section below and we will respond shortly. Click the Start icon located on the left of the Task Bar to open a menu. Select Control Panel and then Add or Remove Programs. Find the unwanted program and Remove it from the list. Navigate to the left of the Task Bar and open the Start menu. Right-click the program you wish to remove and select Uninstall. Access the Metro UI start menu (tap Windows key) and right-click. Select All apps, click Control Panel and then Uninstall a program. Quick & tested solution for JumpFlip removal.